Katherine Grainger (left) and Victoria Thornley in action at the 2015 World Championships. Victoria Thornley hopes she has booked her place at this summer's Rio Olympics after winning the single sculls at the Team GB rowing trials. The win puts her in a strong position to be selected for Rio, though her place is yet to be confirmed. "I think I'm there, I think I'll be sculling at Rio, but I haven't been told what's happening yet," she said. 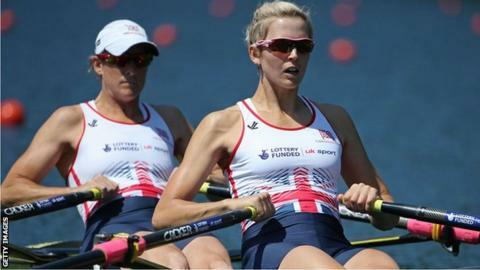 The 28-year old from Wrexham is hoping to partner Katherine Grainger in the double sculls at the Games. Thornley claimed her third successive win at the GB Trials, winning her race by more than seven seconds. Reigning Olympic champion Grainger missed the trials with injury. "It puts me in a good place to win an Olympic trial," added Thornley. "I was confident I could win the race and I had a margin I wanted to win it by ,and I missed that by a little bit. Grainger won the double sculls with Anna Watkins at London 2012, but Watkins has subsequently pulled out of the Olympic Rowing Programme following the birth of her second child. Thornley and Grainger were sixth i the double sculls at the World Rowing Championships in Aiguebelette in 2015. She accepts getting a medal at Rio would be a huge achievement. "I definitely think getting onto the podium come Rio is going to be a hard thing to do," she said. "But it's definitely something that we can do - there's the talent in the boat, we're strong and I feel like we've moved on this season and we're aiming to get on to the podium."